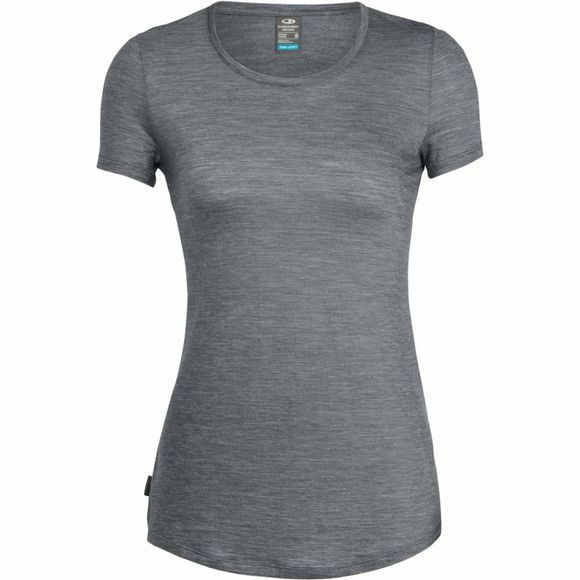 The Women's Sphere Short Sleeve Low Crewe T-Shirt from Icebreaker is a stylish merino T-shirt for everyday wear, a summertime essential. A super-soft, lightweight top that will keep you comfortable all-day long, whether you’re close to home or on far-flung adventures, it’s made from 130gm jersey corespun for comfort and durability. Our Cool-Lite fabric blends two natural performance fibers – merino and TENCEL–to keep you feeling cool and fresh for longer. A great choice if you’re travelling, this tee is odor-resistant and quick-drying. The low, open neck is feminine and cool in the heat, and the drop-tail hem provides added coverage.